NORRISTOWN, Pennsylvania—American Media, publisher of the National Enquirer, was recently the subject of a New Yorker report on its role in buying and then burying stories about President Donald Trump. This wasn’t the first time the company has been accused of doing this sort of thing for powerful entertainers, and Friday, that fact came up as part of the evidence in the criminal trial of Bill Cosby. Cosby is charged with three counts of aggravated indecent assault, relating to the night he is accused of having drugged and sexually assaulted Andrea Constand. Cosby was previously investigated, but then-district attorney Bruce Castor declined to bring charges; Castor has since given plenty of statements and filed lawsuits favorable to the Cosby legal team. After the criminal case was closed, Constand sued Cosby and the National Enquirer in civil court. 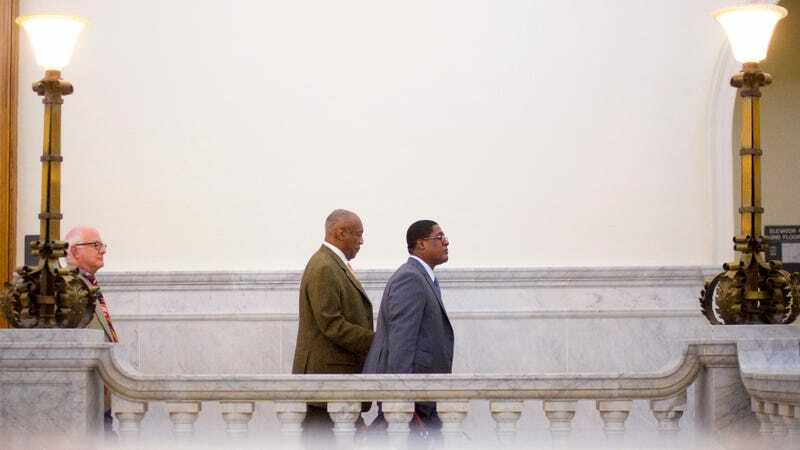 Prosecutors have already discussed Constand’s financial settlement with Cosby, hoping to counteract the defense argument that she was a liar trying to get money from Cosby. In court on Friday, prosecutor Kristen Feden said that the settlement between Cosby and Constand, which was for $3.38 million, included $20,000 from American Media. Feden asked Constand why that money was included. “Mr. Cosby said in this particular article that I had exploited him and that I had taken advantage of him.,” Constand said. “Was that true?” Feden asked. Here is the article in question, which was a part of Constand’s lawsuit. The second half of Friday afternoon was taken up by the start of the cross-examination of Constand by defense lawyer Tom Mesereau. As expected, Mesereau quizzed Constand on her statements to multiple police departments and the differences between those statements. Mesereau asked Constand questions about any sexual harassment and assault training she might have received at Temple, implying she had been told to immediately report any of those to authorities. He asked her about a $5,000 investment she got to try to start a business from the time in her life before her job at Temple. He got in a question about whether Constand ever did drugs with a woman who Constand said she didn’t remember. The question was never answered, because the objection was sustained. Cross-examination will continue Monday. Mesereau’s line of questioning is expected to pick up about emails Constand sent at Temple asking people to pitch in $65 for a business. Mesereau said in court it was a pyramid scheme; so far, Constand has said it was her passing along something she got from a friend.